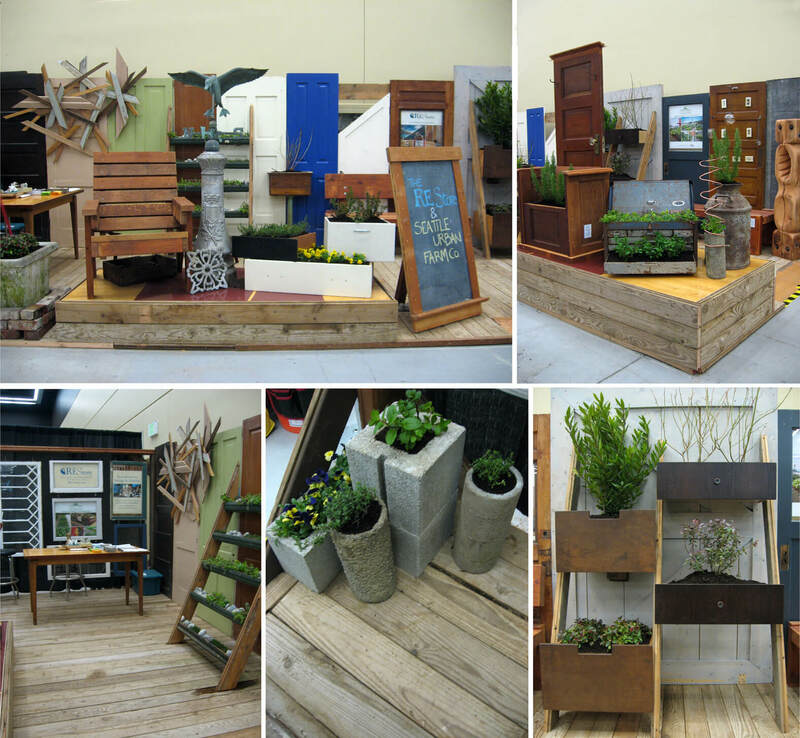 Once again, we’ve had a great time designing and building our booth for the Northwest Flower and Garden Show (February 5th – 9th at the Washington State Convention Center in downtown Seattle). This year our booth’s theme is an “Art Gallery” in line with the larger show’s theme of “Art in Bloom”. Our linear booth is filled with salvage garden and furniture ‘art’ pieces and random reclaimed rummagings used for planters. Our window wall, ‘lean-to’ drawers and gutters as planters, and wall of doors fill out the vignette. Thanks so much to our friends at Seattle Urban Farm Company for teaming up with us on our booth and plant wrangling – and thanks to Sky Nursery for loaning us some plants too. The Flower & Garden Show seminars bring experts on a wide variety of experts on gardening, plants, garden design, food and more. Our REvision Division designer/builders, Eberhard Eichner and James Taylor were chosen to do a demonstration today (Wednesday, February 5th, 6:15p at the DIY stage): High Art From the Junk Pile, Inspiration for Using Just About Anything. Come check out the demo, and see us and the booth for inspiring salvage ideas or to discuss your projects – it is always great to meet new folks and catch up up with old friends at the Flower & Garden Show!